I graduated from Colby College with a degree in Biology way back in 2004. I soon discovered my passion for large whale research and by 2006 I was working full-time in the field. Most of my research focuses on humpback whales, but also includes all large baleen whales found in the same study area (right, blue, fin, sei, and minke whales). I joined the Center for Coastal Studies’ (CCS) Humpback Whale Studies Program and Marine Animal Entanglement Response (MAER) team in 2010. 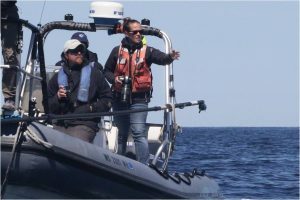 While working at CCS, I became one in only five women in the US permitted to lead disentanglement responses on baleen whale, except for right whales, and responded to over 50 cases of large whales and sea turtles entangled in fishing gear. Although I loved my job, I knew I had to return to school to gain the analytical and writing skills required to pursue my research interests. 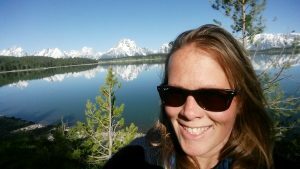 While looking for a graduate program, I moved to the West Coast with my husband in 2017 and began working with Cascadia Research Collective (CRC). I was able to continue my research on baleen whales, but expand my experience to West Coast populations. Since joining CRC, I have covered almost the entire coastline of Washington, Oregon, and California while collecting data about baleen whale populations and participating in many disentanglement responses. I am lucky that I can continue working with CRC as I begin my graduate work at Moss Landing Marine Laboratories. I joined the Vertebrate Ecology Lab in the fall of 2018 under the guidance of Dr. Alison Stimpert and Dr. Gitte McDonald. My thesis is focused on the feeding ecology of humpback whales in the Gulf of Maine and is funded by the Volgenau Foundation. I will be using data from archival digital tags from Stellwagen Bank National Marine Sanctuary tagging project and CCS’s long-term humpback whale population dataset to determine the effect of demography on the feeding ecology and cooperative behavior of humpback whales in the Gulf of Maine. I look forward to gaining the skills I need to progress in this field and continuing to participate in research projects with my colleagues on both coasts.